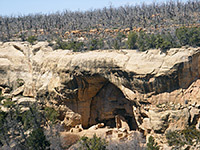 The majority of the viewable ruins and cliff dwellings in Mesa Verde National Park are found on Chapin Mesa, as are most visitor facilities, and unlike the other main location (Wetherill Mesa), the access road is open all year, kept free of snow during the lengthy cold winters of this high elevation area (7,000 to 8,000 feet). Including the various loops the road is 14 miles long and passes dozens of overlooks, several short paths, two longer trails and three dwellings open to the public (Cliff Palace, Balcony House and Spruce Tree House), hence there is enough to see for at least one full day. Map of Chapin Mesa and the national park. 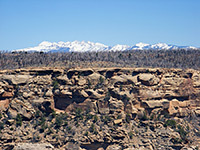 32 views of Mesa Verde - gallery, slideshow. Fifteen miles from the park entrance, the road arrives at the Far View visitor center, for general information, souvenirs and cliff dwelling tour tickets; also nearby are Far View Lodge and Far View Terrace, providing refreshments and accommodation (all three are open from April to October). Driving south, the first ruins are at Far View, where a 0.7 mile loop trail visits a small reservoir and five village sites - two (Megalithic House and Far View Tower) are in the forest a little way north of the parking area, and not so interesting, while the other three are larger, and closer to the road. 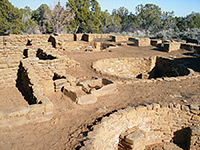 Named Coyote Village, Far View House and Pipe Shrine House, all have inter-connected rooms and several kivas, some keyhole-shaped, and all are built of the rich red/brown Cliff House Sandstone typical of all dwellings in the region. The next site, reached by a short side road, is Cedar Tree Tower, a small solitary structure on the mesa top, surrounded by pine forest, all severely burnt in recent wildfires. The half mile Farming Terrace Trail starts here, looping through flattish land once used by the Anasazi for agriculture. The road divides half a mile south of the tower, leading to three one-way sections past different collections of ruins - Cliff Palace Loop, Mesa Top Loop and Spruce Tree Loop. Cliff Palace is the largest and most famous cliff dwelling in Mesa Verde, and one of the three sites in the national park that are viewable close up on a ranger-guided tour, though the ruins can also be seen in good detail from an overlook just to the north, and from several viewpoints along the Mesa Top Loop to the west. The palace was (re)discovered on a wintry morning in 1888 by two cattlemen, and has been subject to a fair amount of reconstruction yet the majority is original, well preserved and extensive, comprising 150 rooms and 23 kivas. Like most such dwellings the palace is built under a big alcove below the edge of the mesa, so receives limited sunlight - these ruins are in full shadow all morning and half sun in the afternoon, so photography can be a little difficult. Tours depart every half hour at peak times and last for one hour, of which about 15 minutes is spent slowly walking - down a stairway through the rocks and along a path in front of the ruins - and the remaining 45 minutes is for listening to the ranger talk, including about 5 minutes of safety warnings. The path does not enter any of the rooms, and returns to the mesa top by a short climb on the south side; if open to unaccompanied hiking, all could be seen in ten minutes or so. After Cliff Palace the loop road follows the edge of Cliff Canyon, past several overlooks, giving views of other, more distant ruins including House of Many Windows and Sun Temple, then turns east and for a few hundred feet crosses into the reservation of the Ute Mountain tribe, who operate an information center beside the road (not always open). There is one further overlook to the east, towards Hemenway House, sheltered beneath a huge overhang on the far side of a big ravine (Soda Canyon), before the extensive parking area for Balcony House, another of the dwellings visitable by a ranger guided tour, and one not visible from the road. The approach is rated strenuous, though the trail should still be very easy for the average hiker. The descent is down steps cut in the rock followed by a 32 foot climb up a double-width ladder, a walk through a narrow opening and an ascent of a shorter ladder to a flat area in front of the main part of the structure. Exit is via a short tunnel (crawling required) and a climb up several other ladders. The village is quite compact and well constructed, with 40 rooms and a range of authentic features - kivas, T-shaped doorways, angular walls, protruding posts and several types of tower. The ruin is quite sheltered, in full shadow most of the day, located 50 feet below the rim on the west side of Soda Canyon, and may be viewed from afar at only one location, at the end of the level, 0.6 mile Soda Canyon Overlook Trail, starting a short distance north. The first stop along the Mesa Top Loop is by the remains of a pithouse. 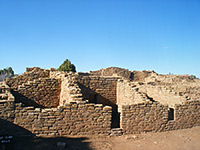 There are dozens of such dwellings on the plateau, dating from the earliest settlement period at Mesa Verde (550 to 750 AD); most are just overgrown, unexcavated piles of rubble but this one has been unearthed and the site cleared, to leave neat rows of stones where the walls used to be, and traces of fireplaces and doorways. The ruins are enclosed by a metal frame shelter, necessary to protect the site but detracting from its appeal. 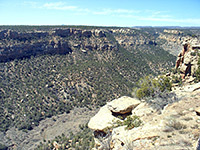 The road then reaches the edge of one of the largest ravines in the park (Navajo Canyon), and an overlook reveals several distant, inaccessible ruins along the far side, including Echo House directly opposite. 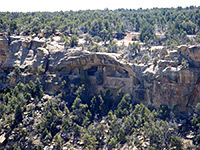 Just beyond, at the foot of a little side ravine, stands Square Tower House, an intricate, well preserved cliff dwelling containing several kivas and towers (one is four floors tall, the highest structure in the park). The ruins can be seen at the end of a quarter mile trail, and a second short path a little way beyond loops around three more pithouses, also beneath protective canopies, as are another three, further along the road. 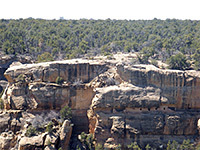 The next overlook is Sun Point View, giving a panorama of the lower end of Cliff Canyon and at least five cliff dwellings (including Cliff Palace, Oak Tree House and Sunset House). Fewkes Canyon, a half mile long tributary, joins from the west and the road runs along the rim, past yet more ruins, all on the far side, and close together; they are, from north to south, Fire Temple, New Fire House, Oak Tree House and Mummy House. The last stop on the Mesa Top Loop is Sun Temple, a large, ceremonial building reached by a spur road along the east edge of Fewkes Canyon. The temple is a stabilized surface ruin, uncovered but restored, its thick, 5 foot high walls capped with reddish concrete. The site is quite impressive though difficult to photograph effectively as there is no elevated overlook. The short paths around the temple also have a good view of Cliff Palace to the east, on the far side of Cliff Canyon. Spruce Tree Loop is the location of all visitor services on Chapin Mesa - the road passes an archaeological museum, bookstore, amphitheater, ranger station, restaurant, gift shop and picnic area. There is only one ruin in view but this is one of the largest and best preserved in the park. Spruce Tree House can be seen from the canyon rim behind the museum, and may be reached by a 0.25 mile trail that descends 100 feet, open to unaccompanied hikers from spring to fall, and to ranger guided tours in winter. However, following a rock fall in 2015 and concerns about other unstable areas, the site has been closed to the public for the foreseeable future. The dwelling has about 130 rooms and 8 kivas, and was home to 80 people. The 2.4 mile (loop) Petroglyph Point Trail also starts here, staying close to the canyon rim south of Spruce Tree House then descending to the base of the upper segment of the cliffs, past a not-so-exciting panel of petroglyphs. The only other extended path on Chapin Mesa is the Spruce Canyon Trail (2.1 miles), looping along the deep ravine to the west, within sight of a few cliff dwellings high up on the far side.